Molds - we used four molds - vampire teeth pop mold, spider cookies, cat & pumpkin cookies and gravestone mold. 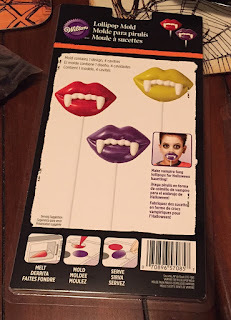 They have them at Michaels, Amazon and Jo Ann Fabrics. 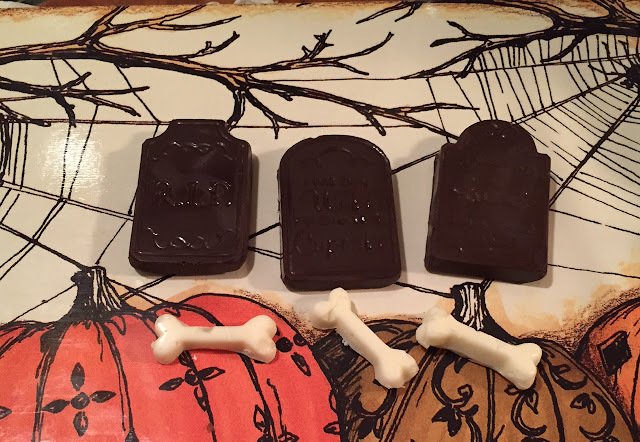 Let's start with the Gravestones and bones chocolates, since they are the easiest. 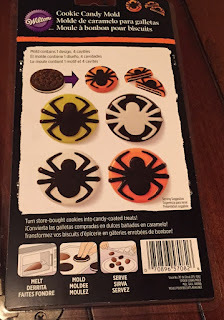 You use two colors of chocolate but in different areas of the mold. Put about 1.5 cups of chocolate melts into your container. Any more and you might have trouble melting it. Any less and you won't have enough. Put the chocolate in the microwave for 30 seconds. Take it out and stir. It won't be fully melted yet. Put it back in for 15 seconds increments removing and stirring each time until melted. Don't put it in for longer, because if the chocolate burns, you can't save it. It seems like everyone has to learn this one the hard way. The white chocolate takes longer to melt than the dark chocolate. Fill your molds. 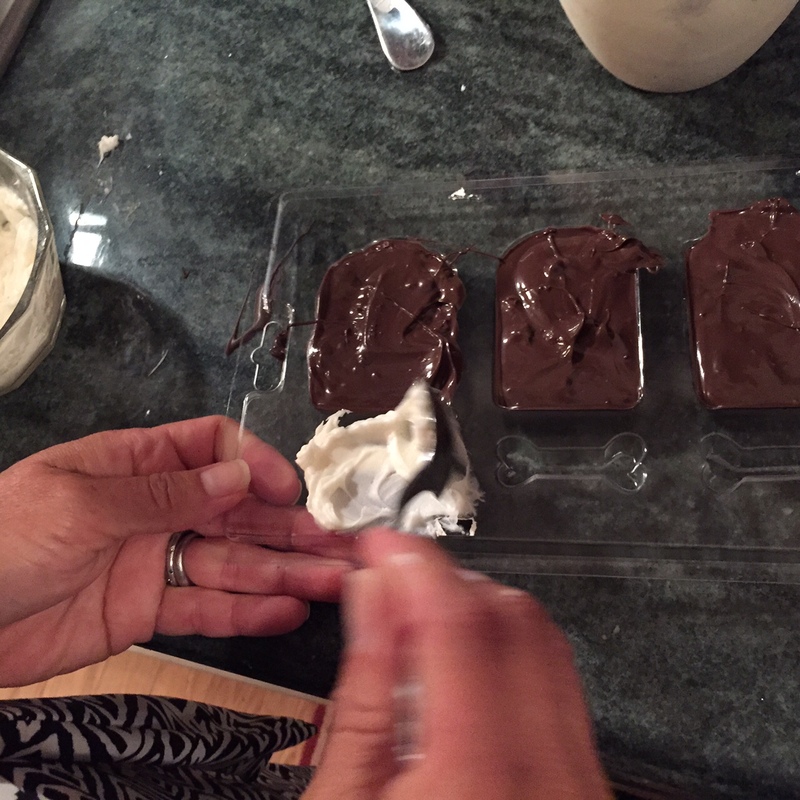 Push the chocolate down into the shape, especially the white chocolate. Look underneath to make sure you don't have bubbles showing. Wipe away any excess if you can. Once your molds are full, put them in a flat place in your fridge. In five to ten minutes they will be done and ready to pop out of the molds. Trim any undesirable excess carefully with a knife. I put them in a little bag together. It looks so cute. 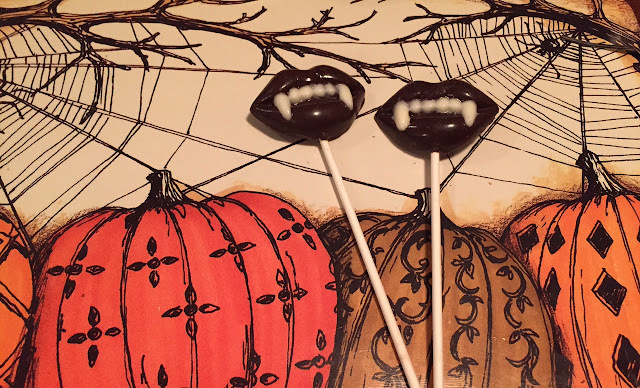 You'll need two colors of chocolate for this one: White and Dark. Melt the white first and just put in about ten wafers. Use the same melting directions as above. Put some white chocolate in the squeeze bottle. 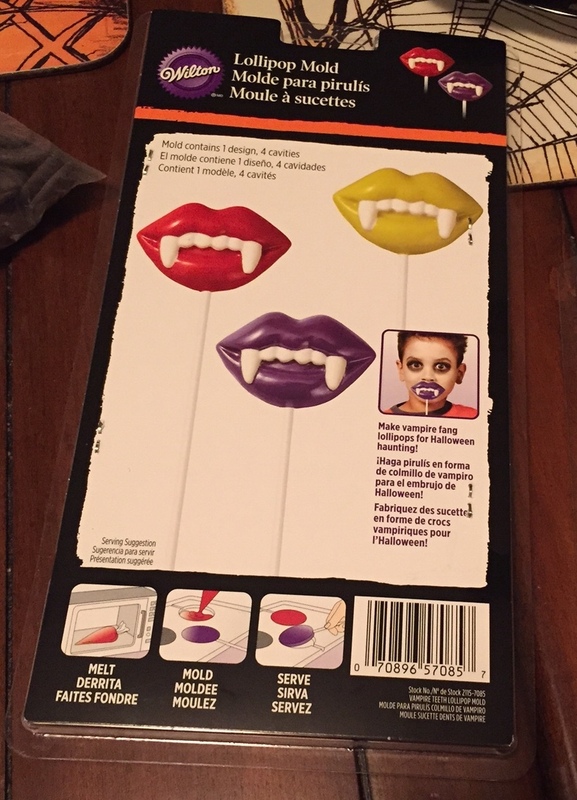 Fill in your vampire teeth in the mold. Wipe away any excess that you can. Put this in the refrigerator for a few minutes. Melt the dark chocolate. Fill in the rest of the mold. Wipe away any excess. Put it back in the fridge. Take it out in about five - ten minutes. Use a knife to get rid of any excess. Melt your chocolate as you did above. If you want to make a different color chocolate design as we did in the photo below, melt one color and fill a squeeze bottle with the first chocolate. Fill the squeeze bottle with the first color of chocolate. 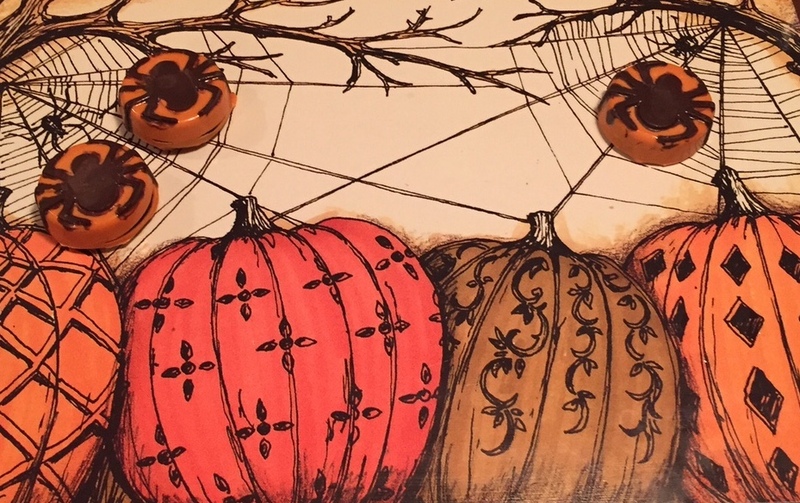 Fill in your design like the spider below. 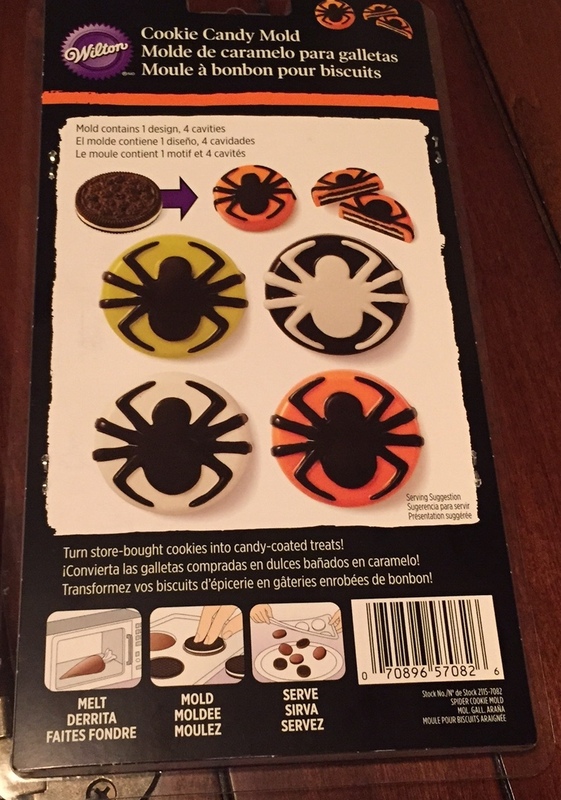 Ours were never as neat at the photo on the package :(. After that dries melt a second color of chocolate. 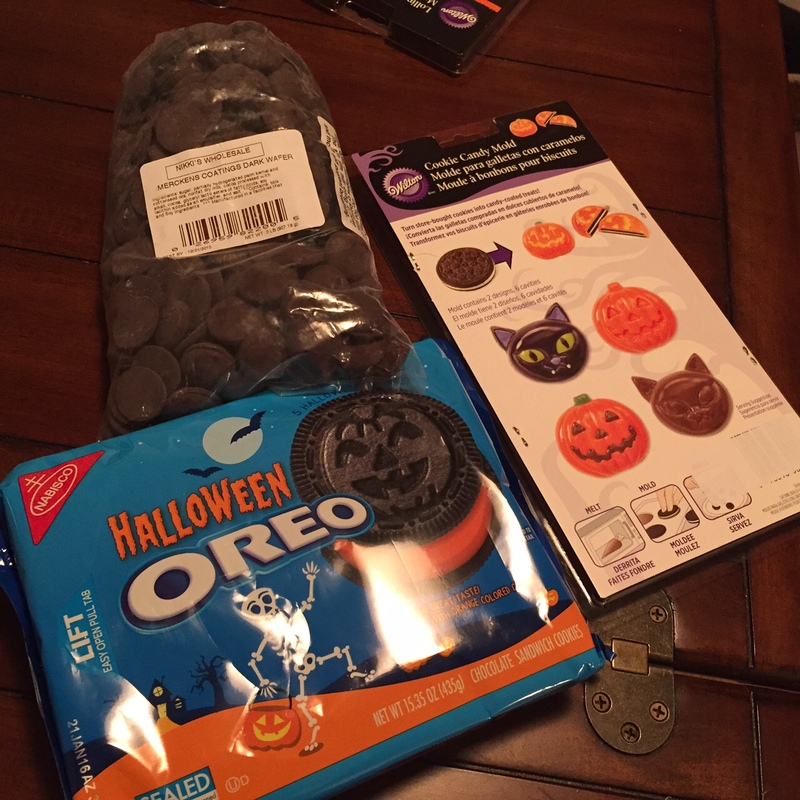 Put some in the cookie mold but only fill it half way. Then put your cookie in and cover it with chocolate. Put it in the fridge to harden, and you're done! Come back next week for another Halloween Treat Tutorial. These all look great. They make me hungry! 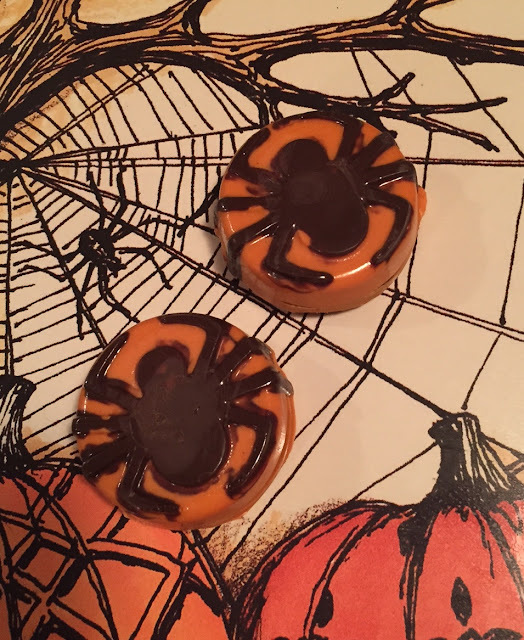 It was so fun to make these and they are delicious.